First Place Web Host has been hosting web sites and registering domain names since 1996. Serving the state of Pennsylvania, including Erie, Philadelphia, Pittsburgh, Lancaster and Harrisburg, we host some of the most visited sites on the Internet and have been growing at an astounding rate since our inception. We heavily invest in our infrastructure to ensure that we provide top notch service for our business clients. We provide award-winning service and support paired with unparalleled response time. Focused on giving our customers exactly what they need, expect, and deserve when working with a hosting partner, we provide an economically priced hosting service that comes with the #1 service in the industry. The great thing about the internet is that someone, from anywhere in the world, can access your website while you stay put where you are. For that reason, it doesn't matter your proximity to your website host - whether you're looking for a robust dedicated server or starter web hosting service, you can, and will, maintain your website from the comforts of your office. You should always look for a hosting company that is in a secure location away from the threat of frequent severe weather. 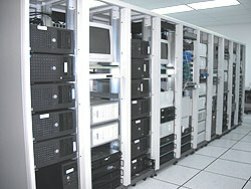 If you live in a hurricane-prone area, your server doesn't need to - and shouldn't! You need maximum up-time, and we're here to bring it to you!